"The Number 1 Online Dolphin Store." Online Shopping For Dolphin Lovers. Art, Sculptures, Gifts, Collectables, Tables and More. A division of the Seven Dolphins Network! Values from $25 through $500,000! Our On-line shop utilizes SSL (secure socket layer) technology! Affordable quality at everyday low prices. Are you interested in learning more about dolphins and other sea creatures? Check out these informational nonprofit organizations! Remember, all of our items come with a 30 day 100% money back guarantee*. Thank you for shopping at Dolphins Unlimited! We welcome you to contact us via email, and we will get back to you within 1 business days. 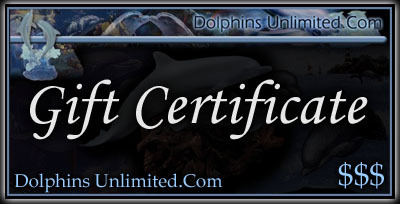 with affordable and beautiful Dolphin Gifts, Dolphin Sculptures, Dolphin Figurines, Dolphin Collectibles, Dolphin Statues, Dolphin Clocks, Dolphin Collectable Plates, Dolphin Candle Holders, Dolphin Picture Frames, Dolphin Art, Dolphin Afghans and more!!! We also accept Visa Check Cards and Debit Mastercards! of the Seven Dolphins Corporation is prohibited by law. Deal of the Day©, Deal of the Hour©, are Trademarks of Seven Dolphins Inc.